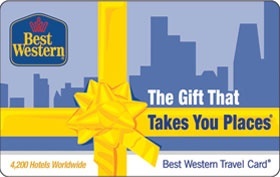 Best Western Travel Card® allows you to fit 80 countries into your wallet. Travel cards are accepted at all of Best Westerns' 4,000 properties worldwide and they never expire. Explore the world with one convenient card. Register your Travel Card to check your card balance at travelcard.bestwestern.com. Applicable toward Best Western hotel charges. Not exchangeable for cash and no change will be given. Fully transferable. Card not replaceable if lost, stolen or destroyed. Visit travelcard.bestwestern.com for complete terms & conditions. Terms are void where prohibited by law. Issued in Arizona, U.S.A. Best Western International, Inc. Best Western and the Best Western marks are service marks or registered service marks of Best Western International, Inc. All rights Reserved. ++ 800 22 73 28 85 within Europe and most other countries or call your local Best Western reservations number or visit travelcard.bestwestern.com.